This enthralling story of survival is the first major narrative of the exploration of North America by Europeans (1528-36). The author of Castaways (Naufragios), Alvar Núñez Cabeza de Vaca, was a fortune-seeking nobleman and the treasurer of an expedition to claim for Spain a vast area that includes today's Florida, Louisiana, and Texas. A shipwreck forced him and a handful of men to make the long westward journey on foot to meet up with Hernán Cortés. In order to survive, Cabeza de Vaca joined native peoples along the way, learning their languages and practices and serving them as a slave and later as a physician. When after eight years he finally reached the West, he was not recognized by his compatriots. In his writing Cabeza de Vaca displays great interest in the cultures of the native peoples he encountered on his odyssey. As he forged intimate bonds with some of them, sharing their brutal living conditions and curing their sick, he found himself on a voyage of self-discovery that was to make his reunion with his fellow Spaniards less joyful than expected. Cabeza de Vaca's gripping narrative is a trove of ethnographic information, with descriptions and interpretations of native cultures that make it a powerful precursor to modern anthropology. Frances M. López-Morillas's translation beautifully captures the sixteenth-century original. Based as it is on Enrique Pupo-Walker's definitive critical edition, it promises to become the authoritative English translation. Enrique Pupo-Walker is Centennial Professor of Spanish and Portuguese at Vanderbilt University. 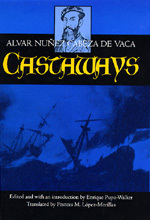 His edition of Naufragios was published in Spain in 1992. Frances M. López-Morillas is an award-winning translator living in Austin, Texas.